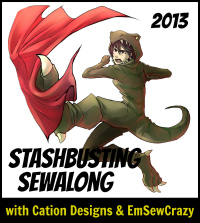 Cation Design and EmSew announced the plan for the February stashbusting challenge. In February, I am supposed to sew for a loved one. Again, I was just thinking about starting a project for Jeff, so this totally works for me! He wants me to try making a quilt with triangles so I can see how difficult they are to work with. He's designing another quilt pattern (separate from the one below) with triangles and wants to make sure I won't go buggy working with odd triangular shapes. So, as practice for the bigger event, I'm going to make this small quilt. 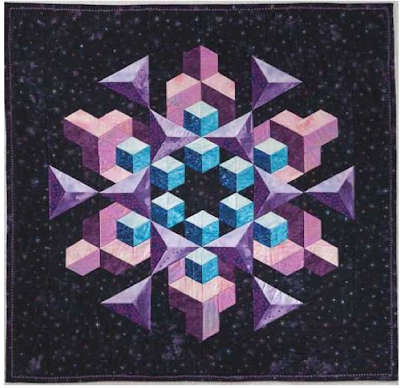 It's called "Space Crystal, Too" and appears in the quilt book ABC 3-D, Tumbling Blocks and More by Marci Baker. This project is supposed to use about another 5 yards. I've already got the fabrics picked out and I'm ready to start. Wish me luck!